Makeup and beauty !!! 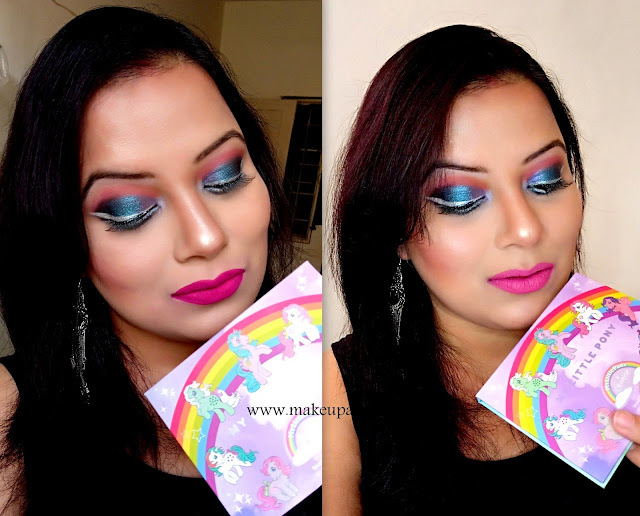 : REVIEW AND SWATCHES AND FOTD using COLOURPOP MY LITTLE PONY Pressed Powder Shadow Palette(limited edition). REVIEW AND SWATCHES AND FOTD using COLOURPOP MY LITTLE PONY Pressed Powder Shadow Palette(limited edition). Anyways so today's post is all about the new COLOURPOP MY LITTLE PONY Pressed Powder Shadow Palette(limited edition). The palette has been launched just a few months back. The main attraction of the palette (at least I feel ) is the packaging. The little pony figures all over the palette making it so pretty that I couldn't resist myself and invest my money in it. COLOURPOP MY LITTLE PONY launched as a collection which consists of many products but as I am an eyeshadow lover and I already have so many shades of colourpop lipsticks that I picked this palette only. Price:- 16$ and I bought it from an Instagram seller BEAUTYNATION in Rs.1650/-. Pressed Powder Shadow Highly pigmented shadow that applies evenly and feels ultra-velvety and silky. This long-wearing formula contains a unique combination of softer powders which adheres easily to the eyes, gives a soft focus effect, and blends smoothly and evenly. Finish Matte, Metallic, SatinShade Neutrals, Oranges/Corals, Purples, Pinks, Blues/Teals. Butterscotch: Synthetic Fluorphlogopite, Talc, Boron Nitride, Zinc Stearate, Lauroyl Lysine, Magnesium Stearate, Dimethicone, Caprylic/Capric Triglyceride, Silica, Phenoxyethanol, Caprylyl Glycol, Dimethiconol, Ethylhexylglycerin, Hexylene Glycol, Blue 1 Lake (CI 42090), Carmine (CI 75470), Mica (CI 77019), Red 40 Lake (CI 16035), Titanium Dioxide (CI 77891). Blossom: Dimethicone, Boron Nitride, Magnesium Stearate, Lauroyl Lysine, Dimethiconol, Phenoxyethanol, Talc, Caprylyl Glycol, Ethylhexylglycerin, Hexylene Glycol, Bismuth Oxychloride (CI 77163), Carmine (CI 75470), Iron Oxides (CI 77491), Mica (CI 77019), Red 40 Lake (CI 16035), Titanium Dioxide (CI 77891). Starshine: Boron Nitride, Dimethicone, Lauroyl Lysine, Magnesium Stearate, Dimethiconol, Phenoxyethanol, Talc, Caprylyl Glycol, Ethylhexylglycerin, Hexylene Glycol, Bismuth Oxychloride (CI 77163), Iron Oxide (CI 77491), Mica (CI 77019), Red 40 Lake (CI 16035), Titanium Dioxide (CI 77891), Yellow 5 Lake (CI 19140). Bluebell: Talc, Boron Nitride, Dimethicone, Lauroyl Lysine, Caprylic/Capric Triglyceride, Magnesium Stearate, Phenoxyethanol, Caprylyl Glycol, Dimethiconol, Ethylhexylglycerin, Hexylene Glycol, Triethoxycaprylylsilane, Bismuth Oxychloride (CI 77163), Iron Oxides (CI 77491, CI 77492), Mica (CI 77019), Titanium Dioxide (CI 77891). Applejack: Synthetic Fluorphlogopite, Talc, Boron Nitride, Zinc Stearate, Lauroyl Lysine, Magnesium Stearate, Dimethicone, Caprylic/Capric Triglyceride, Silica, Phenoxyethanol, Caprylyl Glycol, Dimethiconol, Ethylhexylglycerin, Hexylene Glycol, Carmine (CI 75470), Iron Oxides (CI 77491, CI 77499), Mica (CI 77019), Titanium Dioxide (CI 77891). Skydancer: Dimethicone, Calcium Aluminum Borosilicate, Boron Nitride, Magnesium Stearate, Lauroyl Lysine, Silica, Dimethiconol, Phenoxyethanol, Talc, Caprylyl Glycol, Ethylhexylglycerin, Hexylene Glycol, Tin Oxide, Bismuth Oxychloride (CI 77163), Carmine (CI 75470), Ferric Ferrocyanide (CI 77510), Mica (CI 77019), Titanium Dioxide (CI 77891). Minty: Synthetic Fluorphlogopite, Boron Nitride, Zinc Stearate, Talc, Lauroyl Lysine, Magnesium Stearate, Dimethicone, Caprylic/Capric Triglyceride, Silica, Phenoxyethanol, Caprylyl Glycol, Dimethiconol, Ethylhexylglycerin, Hexylene Glycol, Carmine (CI 75470), Manganese Violet (CI 77742), Mica (CI 77019), Titanium Dioxide (CI 77891), Ultramarines (CI 77007). Flutterbye: Synthetic Fluorphlogopite, Talc, Boron Nitride, Zinc Stearate, Lauroyl Lysine, Magnesium Stearate, Dimethicone, Caprylic/Capric Triglyceride, Silica, Phenoxyethanol, Caprylyl Glycol, Dimethiconol, Ethylhexylglycerin, Hexylene Glycol, Iron Oxides (CI 77492), Mica (CI 77019), Red 40 Lake (CI 16035), Titanium Dioxide (CI 77891). Twilight: Dimethicone, Boron Nitride, Magnesium Stearate, Lauroyl Lysine, Dimethiconol, Phenoxyethanol, Talc, Caprylyl Glycol, Ethylhexylglycerin, Hexylene Glycol, Bismuth Oxychloride (CI 77163), Ferric Ferrocyanide (CI 77510), Iron Oxides (CI 77491, CI 77499), Mica (CI 77019), Titanium Dioxide (CI 77891). Firefly: Dimethicone, Boron Nitride, Magnesium Stearate, Lauroyl Lysine, Silica, Dimethiconol, Phenoxyethanol, Talc, Caprylyl Glycol, Ethylhexylglycerin, Hexylene Glycol, Aluminum Powder (CI 77000), Bismuth Oxychloride (CI 77163), Chromium Oxide Greens (CI 77288), Ferric Ferrocyanide (CI 77510), Mica (CI 77019), Titanium Dioxide (CI 77891). Snuzzle: Dimethicone, Synthetic Fluorphlogopite, Boron Nitride, Lauroyl Lysine, Magnesium Stearate, Dimethiconol, Silica, Phenoxyethanol, Talc, Caprylyl Glycol, Tin Oxide, Ethylhexylglycerin, Hexylene Glycol, Bismuth Oxychloride (CI 77163), Mica (CI 77019), Titanium Dioxide (CI 77891). Princess Sparkle: Dimethicone, Boron Nitride, Magnesium Stearate, Lauroyl Lysine, Dimethiconol, Phenoxyethanol, Talc, Caprylyl Glycol, Ethylhexylglycerin, Hexylene Glycol, Bismuth Oxychloride (CI 77163), Chromium Oxide Greens (CI 77288), Ferric Ammonium Ferrocyanide (CI 77510), Ferric Ferrocyanide (CI 77510), Iron Oxides (CI 77491, CI 77499), Mica (CI 77019), Titanium Dioxide (CI 77891). Princess Sparkle: metallic rich smokey turquoise. The palette comes in a beautiful colored packaging. The rainbows, the pony figures and the beautiful Metallic silver printing on the palette make it really attractive. The palette comes in a cardboard packaging which is really hard and so all the shadows are secured. The palette has a magnetic closure. The name of all shadows is written at the back of the palette. All I wished it has one small mirror inside it and a brush in it then it would have been perfect for traveling. The size of the palette is really cute and small and so it occupies a small space in the stash. Overall packaging wise the palette is handy and easy to work with it. The palette has undoubtedly beautiful packaging. 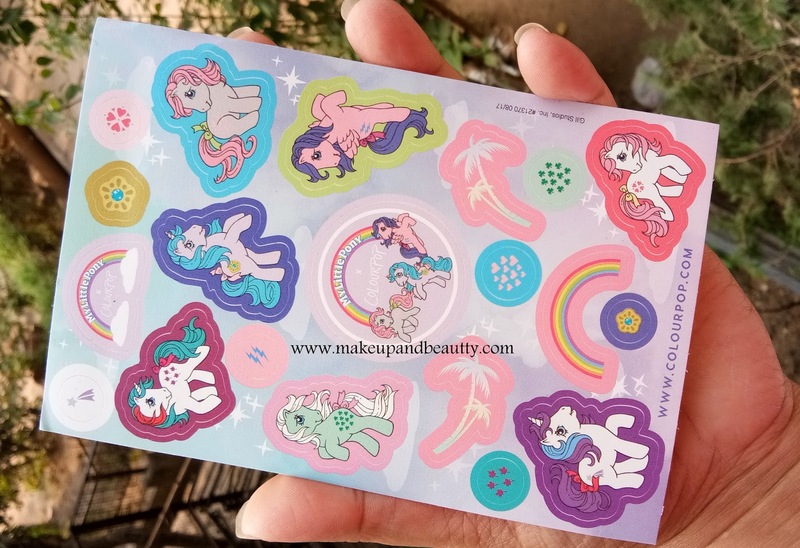 Moreover, I got a Pony sticker free with this palette which is really cute. Coming to the shadows, after COLOURPOP YES PLEASE PALETTE I was having high hopes from this palette. And it just stands out my expectations. All the shadows are super pigmented. Leaving the shade "FIREFLY" all the others have very fewer fallouts. The shade firefly looks like a pressed down pigments for which it works perfectly as eyeliner when mixed up with any medium (which I did it). Rest of the shades have the smooth texture and they are very easy to work with. 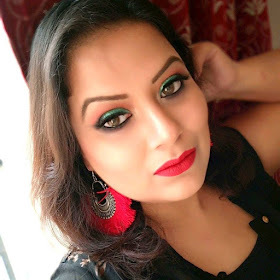 I am amazed seeing the pigmentation of each shadow in this palette, they are super pigmented and so buttery in texture that they can compete with any high-end brand easily in quality. Overall I just love the palette and happy to include it in my colourpop stash. 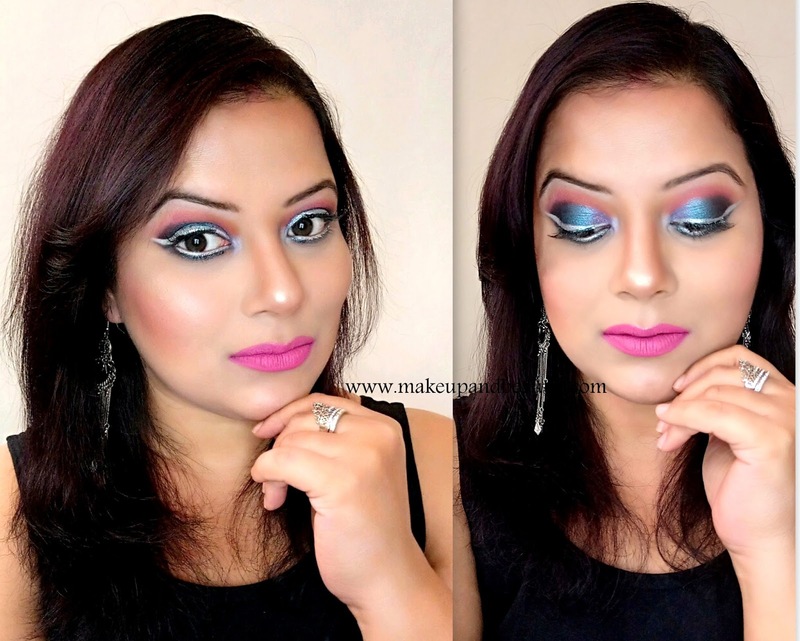 So here is the look that I created using this palette only. The silver-white metallic blue sparkles eyeliner is actually the shadow "Firefly" on top of a concealer. Rest are all the shades are from this palette only. The shadows I used are FLUTTERBYE and SKYDANCER on my crease line. PRINCESS SPARKLE on the outer corner of the eye. TWILIGHT in the middle part of the eye. 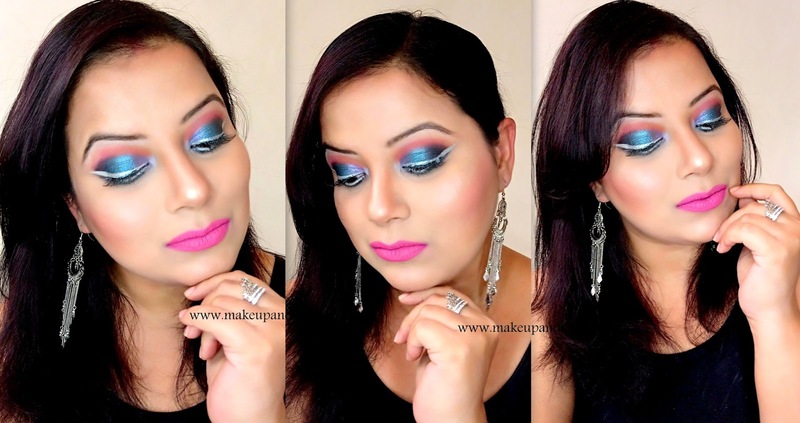 MINTY on the inner corner of the eye. On the lower lashline, I blend TWILIGHT and MINTY to PRINCESS SPARKLE. So, that's all for today. Until next time....Stay healthy and beautiful.